Almost every artist that we haven’t heard for more than 2 years are having a comeback and yes, P!nk is one of them. 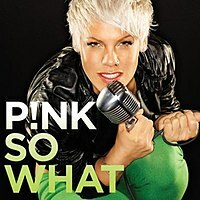 After her 2006 album “Im Not Dead”, P!nk is back with another hit-song titled “SO WHAT”. The song had an impressive debut in Australia reaching number 1 in iTunes after just 8 minutes of release. The single is something under the POP / ROCK category. It has an infectious melody and sound busting vocals with a scorching hot lyrics. “So What, I’m A ROCKSTAR, I’ve got my ROCK MOVES”. In my honest opinion, it’s one of the best songs done by Pink and I know that it will have an international success prior to her upcoming performance at the 2008 MTV VIDEO MUSIC AWARDS on September 7. Pink’s uniquely infectious vocal style is really eminent throughout the song. The song is completely packaged with angst, attitude and catchy music/lyrics. With her career status on the prowl, she definitely has a good comeback that’ll probably earn her more respect as a singer with an angst that you can’t just resist. do you like Pink’s new song? have your say. This entry was posted on August 24, 2008 at 4:18 pm and is filed under Single Reviews with tags I'm Not Dead, Music Video, New Single, P!nk, Pink, So What, YouTube. You can follow any responses to this entry through the RSS 2.0 feed. You can leave a response, or trackback from your own site. yeah. i agree. i really like her last few songs though like “Mr. President” etc.